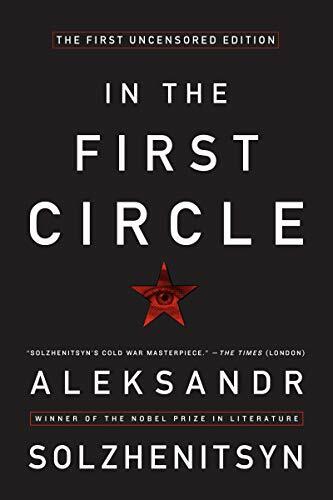 In The First Circle by Aleksandr Solzhenitsyn had a long road to publication. An indictment of the totalitarian Soviet system set in 1949, the novel traces the chain of events set in motion by a junior Soviet diplomat's impulsive, dangerous phone call on Christmas eve to the American embassy. Solzhenitsyn wrote the book between 1955 and 1958, but couldn't get it published in English until 1968, after cutting out nine chapters and many individual scenes to get it past the censors. The version I read is the first uncensored edition, with all cut material restored, published in 2009. The "first circle" refers to Dante's circles of Hell, with the first being the best (or least terrible), in which the luckiest (or least unfortunate) find themselves. The sharakshas, for example, were the best of the gulag prisons, in which prisoners with scientific or technical skills worked on technological projects for the Soviet government and lived in better conditions than those in the labor camps. The novel isn't merely a description of the gulag system, though. A larger "first circle" is that of the Soviet elite--diplomats, high-ranking Party members, military officers. Although they occupy the highest social levels, they're in the first circle of the hell that is Soviet society. At its highest and lowest levels, it is a society that is built on lies and blind glorification of Stalin. Everything works to crush individual achievement and independent thought. Two men's stories comprise the main threads of this complex (but never boring) book. In the first circle of Soviet society is Innokenty Volodin, who makes the phone call that starts the action. Volodin is a young diplomat who has become disenchanted with the Soviet system and yearns for truth and a life with meaning and integrity. His phone call, from a public booth, is an attempt to warn the Americans that one of their number is a spy who is about to give the secret of the atom bomb to the Soviets. The call is listened to and recorded, but his identity is not known. The search for the man who made the phone call leads to the introduction of the other main character, Gleb Nerzhin. Nerzhin is a zek, or political prisoner. His crime: having been a prisoner of the Germans during the war. (Many Soviet prisoners of the Germans were put into gulags upon returning home after the war, on the assumption that they must have picked up some anti-Soviet attitudes after spending so much time with Germans.) Nerzhin is a mathematician who works in an acoustics lab in a sharashka. His group is assigned the task of using electronic voice analysis to identify the man who made the phone call to the American embassy. Many other characters and story lines give glimpses of what life is like for all kinds of people under a totalitarian system that seeks to control not only the movements and behavior but also the thoughts of its citizens, by force and intimidation. This book's wide-angle, multi-storied picture of a society at a particular point in its history kept reminding me of A Suitable Boy. But this is a much more chilling story. It's not the smooth page-turner created by Vikram Seth; rather, it's Solzhenitsyn's tribute to the people who struggle to maintain their integrity of mind in a crushing system. Although there is some humor and many appealing characters, it's a much more harrowing read. No one is free in In The First Circle; they're just occupying different levels of Hell. It is long. I'm actually in the mood for something shorter now. But it is so worth reading, and once I got past the first few chapters and had a handle on all the multiple Russian names (there's a list of characters at the front of the book that's really helpful), I got into the story and its world and started caring about the characters. At the end, I was sorry to leave them. I don't feel like it was a long or tiresome read. This books sounds wonderful! Just the sort of thing I will love to read. Solzhenitsyn is an author I have never read and is on my Classic list. If you will, could you tell why you choose AS books to read?..any special reason? Well, if you want the long story... :) My father was an admirer of Solzhenitsyn. His books were always around our house when I was growing up, although I didn't take an interest then. But I picked up my idea of AS as someone admirable from my dad. Then, last year I read One Day in the Life of Ivan Denisovich while putting together a reading list of modern lit for my daughter. That reawakened my interest in AS. Finally, I came across a mention of In The First Circle on some list or other of great books, and I'd recently read Bloodlands, a history of Hitler's and Stalin's terror, and thought it might be interesting. And by the way, having read Bloodlands really enriched my understanding of the backrounds of some of the characters in First Circle. Yes, I think you'd enjoy this book, Nancy. Apparently the uncensored version was published some time back in Russia, but it took a long time to get it translated/published in English. And, I've just found out through googling, there has been a miniseries of this novel produced in Canada, starring Christopher Plummer! Who knew? I don't know if you still read your blog comments, but I'm thinking of you while reading 'The First Circle". It is better than I expected, it is amazing! My review will be published in a week or two.